Clean, good and convenient if catching a early morning flight. Where to find Baggio hotels near an airport? 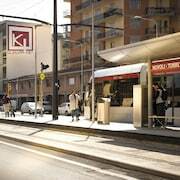 Where can I find hotels in Baggio that are near tourist attractions? If you're thinking of vacationing in the Pistoia area and you're after Baggio hotels, you'll find a comprehensive range to select from. Spend some time looking through our 24 accommodation listings, which are all within a 0.1-kilometre (0.06-mile) radius of Baggio's city center. 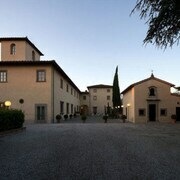 Some of the hotels that are near the heart of Baggio are the Hotel Villa Cappugi and Agriturismo Villa de' Fiori. 35 kilometres (21 miles) from the heart of Baggio, is the Torre di Bellosguardo. 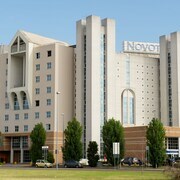 The Riva Lofts Florence is situated 30 kilometres (20 miles) away. Alternatively, book a room at the Grotta Giusti or the Villa Tolomei Hotel & Resort. Montecatini Terme is 20 kilometres (12 miles) to the southwest of Baggio and is home to the Piazza del Popolo and Terme di Montecatini Spa. Should you wish to spend a few nights in Montecatini Terme, check Expedia's booking pages for the latest deals at the Grand Hotel & La Pace and Grand Hotel Francia & Quirinale. 20 kilometres (14 miles) to the west of Baggio, you can also stay at Pescia, home to the Villaggio Albergo San Lorenzo e Santa Caterina and Antica Casa le Rondini. The Pinocchio Park and Gipsoteca Libero Andreotti Civic Museum are popular sites to check out in Pescia. Just because you're on vacation, doesn't mean you can't indulge in your obsession for all things sport. Stadio Artemio Franchi is 35 kilometres (22 miles) to the southeast of Baggio. Sleep right near the action at the Four Seasons Hotel Firenze or the The St. Regis Florence. Peretola Airport is a nearby airport, and is 30 kilometres (18 miles) away from Baggio. 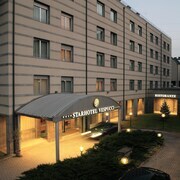 Accommodation options nearby include The Westin Excelsior, Florence and Sina Villa Medici. 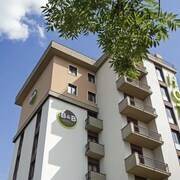 What are the most popular Baggio hotels? Are there hotels in other cities near Baggio? What other types of accommodations are available in Baggio? Explore Baggio with Expedia.ca’s Travel Guides to find the best flights, cars, holiday packages and more!